Do you want to learn how to find and identify edible wild mushrooms? Learning about edible mushrooms can seem like an overwhelming process, but don't get discouraged. Let's take it a step at a time. As mentioned before, there is a great diversity of mushroom species. Given limited space and time, we will only cover some of the most common and best to know here in this article. For starters, mushrooms are the reproductive bodies or "fruits" a fungus. The main body of the fungus is in the form of white, thread-like structures called mycelium. The structures of a typical gilled mushroom consist of a cap, gills and a stalk. The gills are the reproductive portions of the mushroom, and the produce the spores. Spores are reproductive units in the form of single cells. 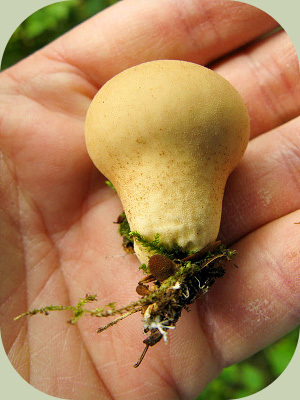 One of the most common and well-known groups of edible wild mushrooms are the boletes or boletus species (Boletaceae). These mushrooms have fleshy caps, and central stalk, and the reproductive parts underneath the cap are made of tubes. These tubes open up into pores at the bottom. Many species in this group are edible, with only a handful being poisonous. 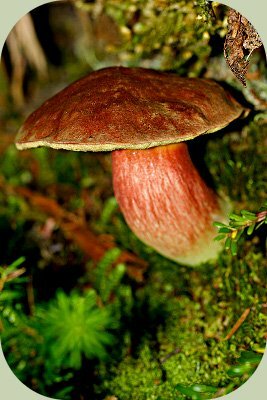 The poisonous boletus species have red or deep orange pores. 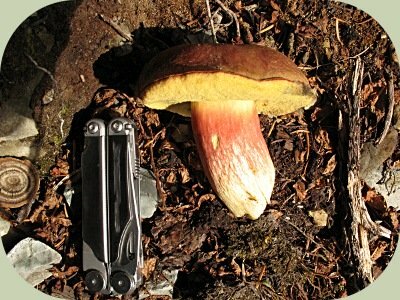 Outside of the few toxic species, some species of boletus are bitter or inedible. One method for testing the edibility of a boletus species is the taste test. You can break off a tiny piece of the cap and putting it in your mouth. It is still strongly recommend that you identify all boletus mushrooms as close to the exact species as possible before trying them. This technique is not recommend for testing the edibility of any other group of species. Cap: A medium-to-large sized cap with a tan, brown or brownish-red top. Pores are whitish in younger specimens, and mature to yellow-olive. Stalk: Thick, often bulbous near the ground and tapering towards the underside of the cap. Stalk surface finely netted, at least near the top. Location: Often grows with firs, spruces and pines. Also oaks and birches in some locations. When: Early fall at lower elevations. Summer in high elevations. Occasional springtime growth. Ediblity: One of the best! Nutty and mild fresh. Should not taste bitter or chalky. Comments: Can grow to several pounds in weight! Can be stored sliced and dried for a years. Cap: A medium sized cap with a brownish-red to reddish top. Pores bright yellow. Stalk: Thick, generally fatter at base tapering at least slightly underneath cap. Stalk pink or pinkish-yellow. Might show some erratic bluing when cut. Location: Found in mixed woods/coniferous forests. Often at middle to high elevations. When: Fruits in the fall. Ediblity: Good. Taste mild raw. Comments: Several similar looking species. Some bitter and inedible. 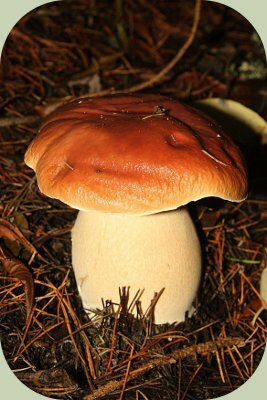 Also dries and stores well, as do many edible wild mushrooms belonging to the Boletus group. Cap: Small-to-medium cap with a brown to blackish gray top. Pores pale, yellowish. Can bruise bluish. Stalk: Short, thick. Yellow background color with a reddish color over it. Often yellow at base. Location: Often found with Douglas firs and redwoods. When: Early fall to early winter. Edibility: Good. Better after drying. Taste is mild raw. Comments: These edible wild mushrooms can grow in extensive groups. Where you see one, there are often many hidden out of sight nearby. Cap: Small-to-medium cap with a tan to dark-brown. Often cracks at maturity exposing pale pinkish flesh. Stalk: Relatively narrow to medium thickness with a yellowish base color and reddish color over it. Often with reddish base. Sometimes bleached to yellow overall. Location: Coniferous and mixed woods. Wide spread. Often in groups. Ediblity: Good. Better after drying. Has a acidic, earthy taste raw. Comments: One of the most numerous boletus species in many locations. Unfortunately, they are also one of the quickest to be infected and consumed by a white mold. If they look moldy, do not collect them. Another group of edible wild mushrooms are the chanterelles (Cantharellaceae). This group is familiar to many and is now available in many grocery stores. This group has fairly thick, blunt, and often forking gills that run down the stalk. The caps are often wavy and concave or even trumpet-shaped. Cap: Small-to-medium cap yellow to golden-yellow. Center often concave, edges of cap wavy and/or upturned. The gills are blunt, ridge-like, growing down the stalk. The gills fork like lightning bolts towards the edge of the cap. Gills have interconnecting veins. Stalk: Tapers to a narrow base. Thickest where it joins the cap. Paler than cap. Location: Found under a variety of conifer and hardwood trees. Often on relatively open forest floors. When: Fall to early springtime. May show up in late summer in areas of high, consistent moisture. Edibility: Good to great. Smell is faintly fruity, sometimes peach-like. Taste mild raw. Comments: Grows often in groups or even fairy rings, sometimes extended over many meters. Similar looking white chanterelle (Cantharellus subalbidus) is paler, often whitish and can grow much larger. Also tends to be found in fewer numbers. Cap: Small cap with yellowish tan to brownish top. Gills are blunt, form raised ridges like previous species, and fork into lightning bolt like pattern towards edge of cap. Stalk: Often slender, yellowish. Hollow at maturity and often when young as well. Location: On the ground, often on rotting wood and/or moss in moist coniferous forests. When: Late fall to winter. Edibility: Good. Best after more extended cooking. Can be dried, but often more chewy afterwards. Comments: Often in clusters or large groups. Maybe be very numerous, with hundreds in one location. Another group of mushrooms that is unique and worth identifying and collecting are members of the Inky Cap family (Coprinaceae). 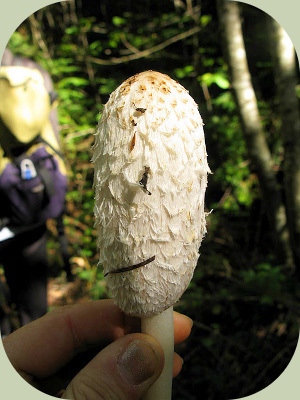 Specifically, the one were most interested in here is the shaggy mane. Cap: Tall, column-like. Attached to stalk at top and hangs down like skirt. White, with brownish shingle-like scales. Gills underneath cap, blade-like and numerous. Stalk: Straight, hollow, long and whitish. Location: Surprisingly, most common in suburban and urban areas! When: Early spring, fall and onto early winter. Prefers cool, wet weather. Edibility: Very good. Delicate, easily perishable. Mush be eaten same day, or can be pickled. Comments: Despite its apparent fragility, often pushed through asphalt. Do not pick those growing near busy roads, as they are often contaminated with car exhaust. 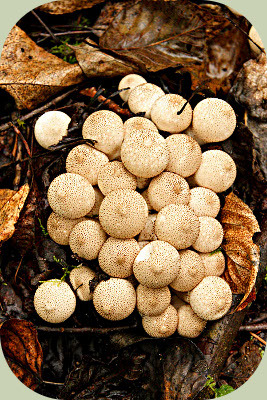 Puffballs (Lycoperdales) are odd, at times, other-worldly fungi which include in their ranks many edible wild mushrooms. They produce spores inside round or oblong sacs. Many of them lack a stalk, some have a sterile base and a few have a long stem. As they mature, puffballs interior turns brown and fills with spores. Then they become dry and powdery, and a small hole forms through which wind or rain puff out the spores. Cap: Shaped like a globe and colored whitish to pale tan. Covered in minute and densely packed spines. Spines soft to touch and brush off easily. Leave behind round scars. Stalk: Thick and short. Same color as cap. Also covered in spines, but often more sparsely. Location: On the ground. Widespread in many habitats, especially along trails and woodland edges. Edibility: Edible and good. Texture similar to tofu. Can only be eaten when pure white inside. Comments: Sometimes growing alone or can be in tight groupings. It is very important to cut these edible wild mushrooms in half and check that they are pure white inside if you wish to consume them. If any yellow or brown is visible inside, discard them. Cap: Shaped just like the previous species, only smooth to a few spines. Color is yellowish to brown. Stalk: Same as previous species. Location: On rotting wood, stumps, logs, sawdust and wood-rich soils. Widespread. Edibility: Edible and with nice texture. Only eat when pure white inside. Comments: Common and can be found in tight groups or singly. The last species of edible wild mushroom we will look at here is probably also the strangest. This group might be called the "body snatchers mushrooms." Members of this group, the Hypomyces, take over the fruiting bodies of other fungi and transform them into something completely different. They reproduce by turning other mushrooms into reproductive organs for their own needs. 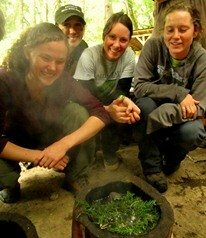 Through this process, they also turn inedible wild mushrooms into edible wild mushrooms! Cap: Grows on and engulfs gilled mushrooms. This species grows mainly on members of the Russula and Lactarius groups. Brilliant orange. Gills of host reduced to folds. Reproductive parts are tiny little red dots. 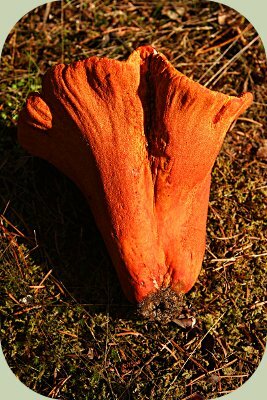 Stalk: Whole fungus tends to transform its host into an upside down cone-shape. Location: In moist woods. Common in some places, rare in others. Often just sticking out of the forest debris. Despite bright color, may be hard to spot initially. Edibility: Edible and tasty. Has a strong odor of seafood and also a seafood taste. Comments: Though this species is generally a parasite on the short-stemmed russula (Russula brevipes), it may use other species as hosts. Occasional allergic reactions have been reported. As with any mushroom species, try it cautiously the first time. Edible wild mushrooms should be approached with respect and with the same cautious you would show whenever you try a new food source. Edible wild mushrooms are a culinary treasure, however, they need to be approached carefully. Some species are deadly poisonous. It is very important that you accurately identify a wild mushroom before consuming it by cross-referencing several field guides, or more preferably, working with someone with experience. Everybody is different, and everybody's response to different foods is different. It is the same for eating edible wild mushrooms. Try each new species cautiously at first. Also, even if you are experience with certain species and wish to consume a vast quantity, it may not be a good idea. Some people have experienced uncomfortable symptoms from over-indulging when eating mushrooms. This is in no way meant to discourage your enjoy and exploration of edible wild mushrooms. There are many wonderful colors, flavors and textures to be experienced among the mushrooms. Not to mention, the process of finding them in the outdoors can be very exciting and rewarding in and of itself.